Everywhere the Muslim population increases, so does vicious Jew-hatred. These Muslim groups on campus should be banned. These groups, Students for Justice in Palestine (SJP) and Muslim Student Association (MSA) chapters, as well as with the Boycott, Divestment and Sanctions (BDS) movement, torment, harass and assault Jewish students on college campuses nationwide. A group of students from the University of Houston (UH) have been routinely expressing the desire to hurt or harass Jews in posts on social media, a covert campus watchdog group revealed on Thursday. Canary Mission — which anonymously monitors anti-American, anti-Israel and antisemitic activities on college campuses — told The Algemeiner that it has uncovered a “disturbing degree of hatred” among 12 current and recently graduated UH students who have posted dozens of violent, racist messages directed at Jews and Israel. A number of these students, the group said, are affiliated with UH’s Students for Justice in Palestine (SJP) and Muslim Student Association (MSA) chapters, as well as with the Boycott, Divestment and Sanctions (BDS) movement. According to Canary Mission, it came as “no surprise” that many of the 12 UH students found engaging in hateful online rhetoric are affiliated with SJP, MSA and BDS. “Hillel professionals and student leaders work with the University of Houston community to ensure a safe environment for Jewish students and the Jewish community,” he said. Twenty-nine out of 100 EU grants administered through EU regional funding programs designated for Israel, the West Bank, and Gaza funnel funds to organizations that actively promote BDS (boycott, divestment and sanctions) – totaling €16.7 million out of €67.1 million (roughly 25%). Forty-two out of 180 EU grantees in total support BDS – through participation in activities and events, signing of petitions and initiatives, and/or membership in explicit BDS platforms. A number of organizations were funded through more than one EU grant, sometimes as part of the same program (“Double Dipping”). A grant titled “Performing Arts: A Pathway Towards Self Expression and Democracy” amply demonstrates this flawed logic. In 2014, during their participation in the EU’s Cultural Programme, all twelve beneficiaries of this grant initiated a group statement calling for a cultural and academic boycott of Israel. The European Union (EU) is the single largest donor to non-governmental organizations (NGOs) active in the Arab-Israeli conflict, accounting for NIS 28.1 million in 2012-2014 to politicized Israeli NGOs alone. Indeed, NGO funding is a central component of EU foreign policy, claiming to promote peace, cooperation, and human rights. In contrast to the stated objectives, the EU funds a number of highly biased and politicized NGOs that exploit the rhetoric of human rights to promote anti-Israel BDS (boycotts, divestment, and sanctions) and lawfare campaigns, inflammatory rhetoric, and activities that oppose a two-state framework. Due to the highly complex and poorly coordinated nature of EU aid and to the lack of a consolidated database differentiating between NGOs and other types of organizations, it is impossible to determine the exact amount or proportions of EU funding to organizations that promote anti-Israel BDS. However, NGO Monitor reviewed a number of EU regional funding programs designated for Israel, the West Bank, and Gaza, and found that 29 out of 100 EU grants administered through the frameworks reviewed funnel funds to BDS organizations (€16.7 million out of €67.1 million – roughly 25%). 42 out of 180 EU grantees in total support BDS – either through participation in activities and events, signing of petitions and initiatives, and/or membership in explicit BDS platforms. Several organizations were the recipients of more than one grant. See below for an explanation of the methodology, numeral analysis of the findings, and list of relevant grants along with BDS activities of respective beneficiaries. When confronted by evidence of funding for NGOs with agendas or values that contradict EU policy, the EU’s recurring response is that it “funds projects submitted by NGOs, in line with [the] EU’s fundamental principles and values, but not NGOs themselves.” This distinction is irrelevant, as project funding inevitably is used for overall organization and activity expenses. Because money is fungible, EU funding ostensibly allocated to specific projects also supports the NGO’s infrastructure including funding for staff, equipment, office space, publicity for the organization and its campaigns, and the significant costs of writing more grant applications, as well as allowing officials of these NGOs to travel and promote their agendas around the world. In several cases, EU funding comprises 50%, 60%, or even 75% of an NGO recipient’s entire budget. Moreover, many recipients feature the EU symbol on their publications and websites, bolstering their legitimacy and linking the EU with the broader political activities and campaigns of the NGOs – such as boycotts and the rejection of normalization. A grant titled “Performing Arts: A Pathway Towards Self Expression and Democracy” (# 16 in the list of grants below) amply demonstrates this flawed logic. In 2014, during their participation in the EU’s Cultural Programme, all twelve beneficiaries of this grant initiated a group statement calling for a cultural and academic boycott of Israel. The group officially registered as the Palestinian Performing Arts Network in the Palestinian Ministry of Interior in February 2015, also during the members’ participation in the EU program. According to their website, which features their BDS statement, the EU and the Swedish consulate in Jerusalem are their sole donors. The following is a list of 29 EU grants, whose beneficiaries include NGOs that participate in BDS campaigns against Israel. All grants have an end date after November 2015. The grants were administered through a number of EU country-based programs: European Instrument for Democracy and Human Rights (EIDHR), European Partnership for Peace (PfP), Non-State Actors (NSA) program, East Jerusalem Programme, and Cultural Programme; for one additional grant (#7 in the list below), the funding program remains unclear (see Additional Information at the end of this document). The list does not include global thematic funding programs; humanitarian funding; country-specific funding to regions other than Israel, the West Bank and Gaza; or any form of indirect funding (for example, EU funds to a church or humanitarian aid group, that are then transferred to a political NGO). A full accounting of the proportion and extent of EU-funding to BDS-supporting beneficiaries is therefore not available. Because many of the BDS-supporting organizations listed here are grant co-beneficiaries, and due to the absence of transparency, it is not possible to determine the exact amount of funding received by each organization. A number of organizations were funded through more than one EU grant, sometimes as part of the same program (see Double Dipping below). Only beneficiaries whose support of BDS could be adequately demonstrated were included. Regardless of whether the NGOs openly declare or deny their support for BDS, all provide material support for BDS initiatives and efforts – either through participation in activities and events, signing of petitions and initiatives, and/or membership in explicit BDS platforms. NGOs whose materials are used to promote BDS but which do not explicitly endorse or participate in these activities are not included. To view the complete list of grants in table form, click here. Minister Katz Presents: The Israeli InitiativeTransport and Intelligence Minister to present program to cabinet including Ma’aleh Adumim sovereignty and Gaza solution. Minister Israel Katz, of both the Transport and Intelligence Ministries, will today (Sunday) present a political program at a security cabinet meeting – the “Israeli Initiative”. “I spoke recently with the Prime Minister about an initiative plan, and we agreed that I bring it up for discussion in the cabinet. With the background of the complex global and regional reality, one must present a comprehensive Israeli diplomatic initiative (of which Ma’aleh Adumim is a part) and of course coordinate with the new US administration, which could support and lead in this initiative,” said Minister Katz. -“Gaza Island” – Building an island with an harbor and water desalination and energy plants, to be connected by bridge to Gaza, allowing the Palestinians an outlet to the world while preserving the security of the State of Israel. -“Eastbound Rail” – A railway network connecting Jordan as a land port with the Sunni Arab states in the East and the Mediterranean ports of Haifa, via the valley railroad, connecting the Palestinians with the network as a reality-changing political/economic process in the region. -The establishment of a “Greater Jerusalem Metropolitan Area” while expanding the boundaries of Jerusalem and strengthening the Jewish majority. Application of Israeli law to the communities of Greater Jerusalem: Ma’aleh Adumim, Givat Ze’ev, Gush Etzion, and Beitar Illit (which are contained in the Israeli consensus ahead of any agreement) and connecting them to the Greater Jerusalem Metropolitan Area while maintaining their municipal independence like Paris and greater London. At the same time one can establish a municipal authority similar to the Jerusalem Arab neighborhoods outside the fence, which are cut off today from urban municipal services. We must decide and clarify Israel’s policy to the U.S. in the fields of construction and settlement, which will allow free construction in Jerusalem to all parts of the population and the building within the blue line of the Jewish communities in Judea and Samaria. Hamas: We’ll fire on Israel, start another war Hamas official says they ‘won’t be like Assad,’ and will show Israel the full force of their military power. In the wake of Gaza’s electricity crisis, Gazan civilians organized demonstrations protesting against the serious lack of electricity and gas, and protesting Hamas’ rule of terror. In response, Hamas has arrested over 280 protesters, using any means available, including live weapons. They also arrested a comedian who made a video about the electricity crisis. At the same time, Hamas threatened to begin firing rockets against Israel, whom they blame for the crisis and their civilians’ anger. Hamas leaders enjoy 24/7 electricity, but give Gazan civilians only three hours of electricity a day. It is worth noting Hamas gets part of their electricity from the Palestinian Authority and part from Israel. The Israeli electricity is also funneled through the PA. The Palestinian Authority has refused to pay their 153 million dollar debt, forcing Israeli citizens to foot the bill instead. Meanwhile, Hamas leader Ismail Haniyeh announced Turkey has agreed to help Gaza by sending large amounts of electricity to Gaza. “If we feel our leadership is being questioned, we will begin firing at Israel. We will not become like Bashar al-Assad, who threatens Israel but never follows through,” a Hamas spokesman said. France’s peace summit began today (Sunday) in Paris without Israeli or Palestinian representatives. The representatives who came from about 70 countries are expected to call on Israeli Prime Minister Benjamin Netanyahu and Palestinian Authority President Mahmoud Abbas to commit to a two-state solution and distance themselves from officials who reject this type of agreement. Jewish community centers in American East Coast cities and Jewish schools in London, England were evacuated due to called-in warnings of explosives in the buildings. Jewish community centers in a widespread number of American states were evacuated due to bomb threats on Monday morning, while across the ocean, the same phenomenon was taking place in London, England as well. Jewish schools across the United Kingdom were placed on alert after bomb threats were called into metro London Jewish schools in Roehampton, Ilford and Brent on Monday morning. The schools were “warned” that explosive devices had been planted on the premises. Thorough searches were conducted at all three sites and other schools were placed on precautionary lock-downs until the “all clear” was received. Bomb threats were also called in to a few non-Jewish schools as well, according to the British Jewish Chronicle news site. “Police were alerted at around 10:30am hrs on Monday, 9 January, to phone calls made to schools in Roehampton, Ilford and Brent in which bomb threats were made. Police officers attended the schools. All three incidents were stood down a short time later. An investigation into the threat will be conducted,” Metropolitan Police said in a statement. Meanwhile, in the United States, bomb threats were called into Jewish Community Centers (JCC)s in Delaware, Tenafly, New Jersey; Miami Beach and Jacksonville, Florida; in Rockville, Maryland; in West Nashville, Tennessee, and Columbia, South Carolina. In Delaware, police were called to search the Siegel Jewish Community Center north of Wilmington on Monday, after a bomb threat was called into the facility at around 11:45 am. The caller reportedly said there was a bomb inside the complex, according to Seth J. Katzen, CEO of the Jewish Federation of Delaware, who spoke with Delaware Online, The News Journal. Meanwhile, in New Jersey, the Jewish Community Center on Palisades in Tenafly sent out a text to its membership warning it had received a bomb threat shortly after 12 noon. As a precaution, officials evacuated the building, which contains a preschool, a senior center and an adult daycare facility for people with disabilities. Parents of preschoolers were asked to pick up their children and all JCC programs were canceled for the day. The “all clear” was received a short time later from the bomb squad that swept the building. 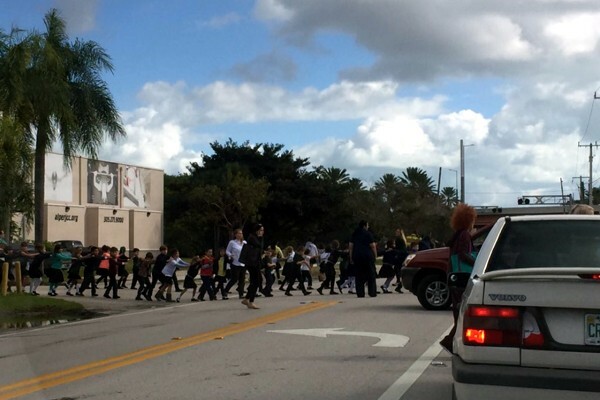 About 450 students and 70 teachers and staff members were evacuated from the Alper JCC School at SW 112th Avenue in southwest Miami-Dade as a precaution, Miami-Dade Fire Rescue officials said. Miami Beach police also were called to the Jewish Community Center on Pine Tree, where only a handful of people were in the building at the time. A thorough search that included K-9 units turned up nothing and the “all-clear” was given. Both threats were called in at around 10:45 am. Both JCCs have been given the “all clear” in Florida. A bomb threat was also called into the Bender Jewish Community Center of Greater Washington in Rockville, Maryland, prompting officials there to evacuate the building, Executive Director Michael Feinstein said. In West Nashville, Tennessee, metro police responded to a report at about 10:30 am of a bomb threat at the Gordon Jewish Community Center, in the 800 block on Percy Warner Boulevard. Officials quickly evacuated the 80 people who were in the building, which functions as a childcare center during the week, according to The Tennessean, part of the USA Today network. Special Agent Michael P. Knight of the Nashville field office of the Bureau of Alcohol, Tobacco, Firearms and Explosives told media the ATF is standing by to provide “technical assistance” as needed. In South Carolina, the Columbia Fire Department and the Richland County bomb squad were also called in just before 11:30 am Monday to scan the Katie and Irwin Kahn Jewish Community Center on Flora Drive in Columbia, WBTV reported. After a thorough scan of the building, nothing was found and the “all clear” was given.